If you thought you would have to travel across the Channel and visit Belgium just to eat waffles, you'll have to think again. 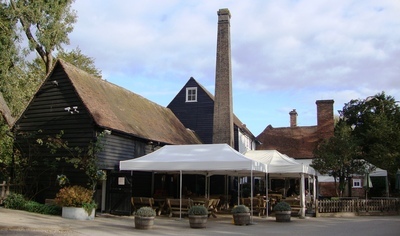 The Waffle House in St Albans has been satisfying the taste buds of people in the area for more than twenty-five years, and operates from a sixteenth century working water mill on the banks of the river Ver. Depending on how busy the restaurant is when you arrive (and it often is extremely busy, especially at weekends and during school holidays) you may have to queue for a table, or you can sit outside when the weather is fine. Once it turns a little colder you may be lucky enough to sit near the open fireplace or perhaps by the staircase leading up to the workings of the mill (although you won't be able to climb the stairs for safety reasons). After being handed the menu, you'll find yourself faced with a dilemma. If you arrive before noon you will be able to order from the breakfast menu, otherwise you'll have to settle for something savoury, whether meat based or vegetarian; or a waffle with fruit, syrup or ice cream. If you feel you would like something a little healthier there is a wholemeal waffle option and if you have a gluten allergy or intolerance you can even choose a waffle made from spelt. The establishment prides itself on taking an eco friendly approach and serves organic and fair trade products as well as recycling wherever possible. Even the flours are ground at a mill just a few miles upriver. They are family friendly and can supply high chairs when necessary, and you're also welcome to bring your family dog, just as long as you're happy to sit outside. I always try to be healthy(ish) and naughty at the same time when I visit for lunch. 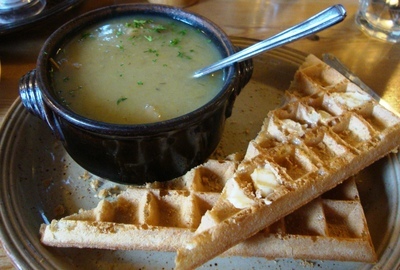 A bowl of their delicious vegetable soup, accompanied by a waffle, butter and syrup keep my hunger pangs at bay.